Eating charcoal sounds about as appetizing as scarfing down some black, charred remains of a Saturday BBQ, but activated charcoal is a whole other animal. Activated charcoal is used as a detox agent to absorb a host of heavy metals, chemicals, and pharmaceutical drug remains that flow through your blood stream and cause a hindrance to your best health. Activated charcoal absorbs the toxins from your body and then, since it is not absorbed by the body, the toxins along with the charcoal are expelled, leaving you cleaner and more toxin-free. Removes heavy metals like lead and aluminum. Removes symptoms of traveler’s diarrhea. Reduces ulcers in the stomach. Can be used as a toothpaste to whiten teeth and eliminate foul breath since it kills bacteria. Reduces gas from eating beans and other gaseous foods. Eliminate many micro-organisms and chlorine from drinking or bath water. Removes pharmaceutical toxins from the body. This includes aspirin overdose, accidental household toxin ingestion, and heavy metals. It has been used for hundreds of years in cases of food poisoning. Ancient Egyptians used activated carbon as did the Native Americans. Removes parasites and bacteria from the body. This includes bugs that cause everything from a stuffy nose to more invasive parasites. “a standard 50g dose” — ??? That’s A LOT! AC is not absorbed into the bloodstream, so it DOES NOT detoxify the blood! No where in this article does the author make the critical distinction that AC only detoxifies the digestive tract. Before she starts offering medical advice, Christina Sarich needs to start doing actual research. Beat me to it, this article is inaccurate and incomplete. It’s also worth mentioning that it shouldn’t be taken internally too often, as it also prevents the absorption of many important nutrients while it’s in your system. Really it should only be used as part of a cleanse or as treatment for something like food poisoning. Yes, that’s a good point. Activated charcoal does not distinguish between wanted and unwanted particles. They’ve given it to animals as a certain % of their food and they’ve been unable to find harm or nutrient deficiency in thos animals. Which nutrients is it supposedly stopping? 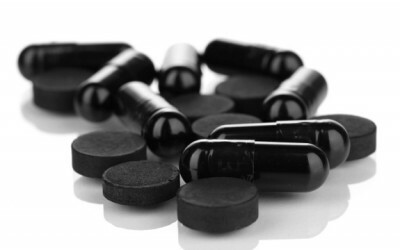 In doses large enough and regular enough to treat food poisoning or other ingested toxins, activated charcoal will absorb and sequester significant amounts of water soluble vitamins and minerals, and if such doses are continued for an extended period of time it can quickly result in dietary deficiency of those nutrients. What percentage of the animal’s food consisted of activated charcoal? I’d imagine that it was much lower than a therapeutic dose. The studies I saw it was usually around 1% by weight of food. Usually they are doing it because many grazing animals often eat food that has various toxins in them. Remember charcoal adsorbs, not absorbs(its not a sponge). One thing I’ve seen is that in hospitals they say if someone has eaten alot of fat, typically they have to increase the dose of AC, so it seems there is some interaction between fat and AC. Now you are talking about it causing a deficiency, which theoretically is true-do you have a study or any other kind of proof that that is actually what happens? I have yet to find one and I regularly look at this stuff. I have been using charcoal for a considerable period of time. It started in the 1980s when I had a smelly labrador pup (charcoal biscuits recommended by Vet) and my interest and regular usage of the product has developed since. I have been cleaning my teeth with it, with a little water, for a few years, during which time I have not required dental treatment nor tooth plaque and the enamel has not been scratched. Whenever my wife, our dogs, or myself, feel unwell and especially after a meal from a restaurant (not including the dogs), we always start by taking a charcoal capsule which usually remedies the problem; if it does not then we know the cause lies somewhere else. It is also good at removing the poisons of stings or snake bites although I have not yet required it for the latter. It is always available in our medicine cabinet for ready use. One of our dogs lately had an operation which required stitches which the dog insisted on licking but by applying a little charcoal it stopped her from this habit. It is also useful to take before a social event or on a flight if only to stop one from voiding wind. We appear to be learning about the many benefits of this interesting and cheap to purchase product. Activated charcoal is excellent at controlling wind or removing a smelly breath both in humans and animals. whenever feeling unwell firstly take charcoal and if this fails to cure after about 30 minutes then the problem has nothing to do with bodily poisons (usually from food or drink). I have Crohn’s, and am very interested in how to prepare it differently for use for the disease (besides a poultice). Thank you! Activated carbon is awesome try brushing your teeth with carbon it removes plaque and whitens your teeth. Entirely agree; I brush my teeth with it every morning and the effect is beautiful white teeth and almost no dental requirements. I also use it as suggested in the article and have done so for many years. Where you buy Activated Charcoal? 50 grams sounds like a hellava lot of cahrcoal for one dose. Is this spaced out over ti=me or taken all at once? 50 grams is, undoubtedly, a clerical error; 5 mg is more likely if taken orally, indeed, a very small amount is sufficient; just the tip of the smallest spoon. There is no adverse side-effect but there could be at 50 grams. I make a homemade face wash with it! Works amazingly on ache prone skin. Can someone recommend a good brand of activated charcoal or where I can get some? Any brand will do; most of it will probably arise from the same source. It is available at HFS or on the Internet. Shungite rock, like charcoal, absorb toxins. Good for water elixirs.